The following comprise the standard terms and conditions of booking a ticket(s) for Wild Pines Park Ltd. In proceeding with the booking it shall be deemed that the Party booker and each and every guest has accepted them. The booking is confirmed once the company has received payment and you, the party booker, has received written confirmation from Wild Pines Park Ltd, this includes email and website confirmation (please check spam folder). There is an advisory height limit 140cm. Anyone under this will need to be accompanied by someone over this height to help them operate the safety system on a 1 to 1 basis. For the Big Zip and Challenge course it is a minimum age of 10 and a minimum height of 150cm. Please make sure that all participants meet these requirements otherwise they will not be allowed onto the 2nd course and no refund will be offered. There is a strict weight limit of 17 stones (108kg). Anyone that doesn't fit into there harness correctly or who is close to this limit may be refused onto the ropes course. Serious injury may result in anyone over this weight limit. It is your responsibility to ensure that all members of your party meet these requirements. Participants must be over 6 years old. Refunds on the day are at the total discretion of Wild Pines Park. We are aware that these activities are not for everyone so please make sure that everyone in your group wishes to participate beforehand. Once you have a confirmed booking, you will have an allocated time slot. It is best that you turn up 15 mins prior to your allocated time. A missed time slot could be treated as a cancelled booking and no refund will be given. Whilst every effort will be made to accommodate you at a later time or date, this may not always be possible. You shall be entitled to cancel or change your booking subject to receiving your request for cancellation/change at least 48 hours before the booked start time. Any requests for cancellation/change must be made by emailing office@wildpinespark.com. It can take up to 28 days for a refund to be processed (usually 24 hours). You shall not be entitled for a cancellation under 48 hours, however you may be able to at our discretion (if we have time slots available) change your time/date. Wild Pines Park Ltd shall be entitled to cancel your booking at any time. In the event that Wild Pines Park Ltd decides to cancel your booking it shall use its reasonable endeavors to notify you as soon as possible. You shall be entitled to a full refund in the event of cancellation under this clause but no other compensation shall be payable. In the event that it proves necessary to close the ropes course for reasons beyond the control of Wild Pines Park Ltd (i.e. extreme weather conditions) and you have started or are about to start the activity you will be offered another date or time or refund. The Activities comprise a challenging high ropes course and participation is not without risk, all participants will receive detailed safety training from an instructor. 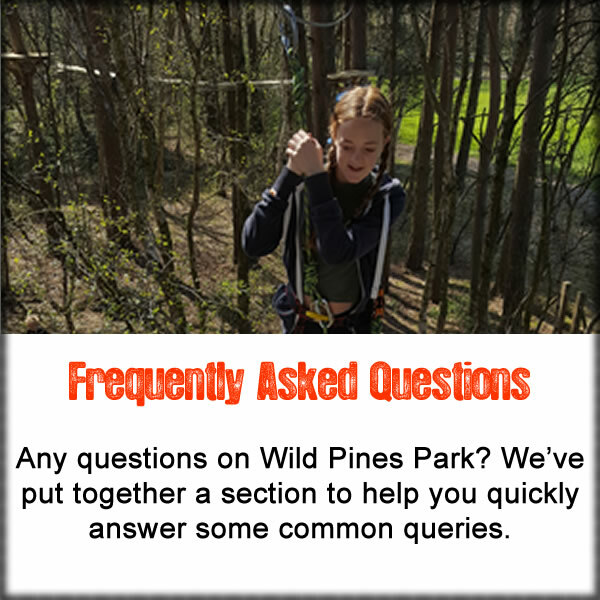 Wild Pines Park Ltd reserves the right to refuse admittance to the ropes course or to remove a participant from the ropes course should it deem it necessary to do so. This includes a participant who does not comply with the safety rules and advice and the safety system or who is deemed to be under the influence of alcohol or drugs. After the safety briefing participants will not be directly supervised by an instructor. Participating adults must sign a Risk Acknowledgment & Regulations stating that he or she will accept responsibility for the safety of him or herself and for supervision of children in his or her care. All participants must be reasonably fit and healthy. It is your responsibility to ensure that all members of your party meet these requirements. All participants are required to wear a safety harness provided by Wild Pines Park Ltd and fitted by one of our qualified instructors. Harnesses are only to be adjusted by the instructor, serious injury can occur if participants attempt to interfere with their harness in anyway. The Activities are physically demanding and require a degree of agility, strength and stamina. If participants are in any doubt as to whether they should attempt the Activities they are advised to walk the course before booking. If participants have medical concerns they are advised to consult their doctor in advance. Participants will be required to certify that they do not suffer from any medical condition which would make it more likely that they would be involved in any incident which could result in injury to themselves or others. Due to the physical nature of the Activities and the fitting of our harness (we make them nice and secure which could be uncomfortable for pregnant woman) we recommend that pregnant women should not take part. You will have to sign a disclaimer to state that you are not pregnant before participating. Participants need to be able to see similar distances to those required to drive a car in order to be able to complete the course and to supervise any under 14’s in their care. Consequently, short or long sighted participants must ensure that they wear contact lenses or prescribed glasses. The Activities will remain open in most weather conditions (but not in circumstances of gales, lightning, heavy ice or snow). No refunds or compensation will be payable by Wild Pines Park Ltd in the event that any participant is not permitted to, or decides not to, undertake or complete the Activities for the reasons set out in this clause. For safety reasons, Wild Pines Park Ltd have the right to refuse entry should a potential customer be inappropriately dressed; i.e. no open toed sandals, flip flops, skirts will be permitted.